Julie started to follow in her mother’s footsteps at just 18 years old! 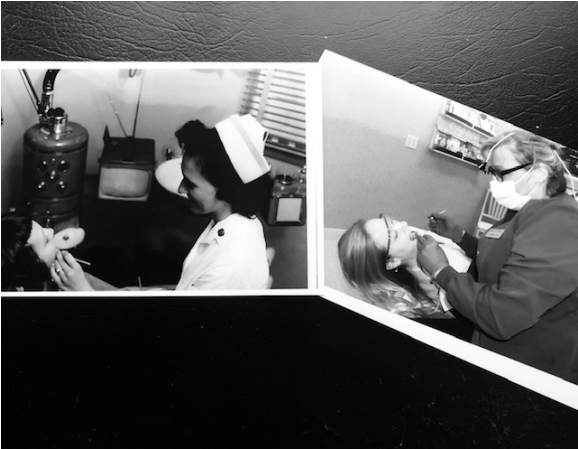 Julie’s mom, Marilyn, worked for Dr. Weisenstein in Columbus, Ohio in her first dental hygiene job in 1959. Marilyn first learned of the hygiene field through a friend who knew the Dean of the dental school at Ohio State, when she was 21 years old. 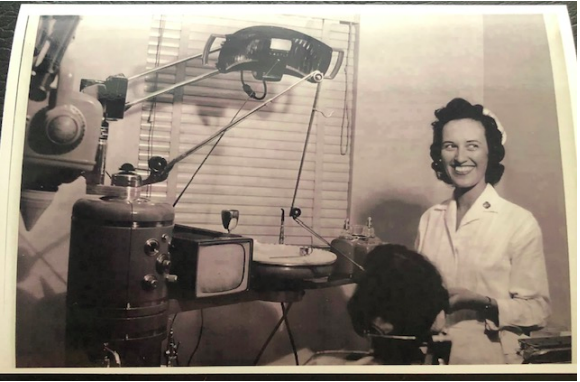 She graduated in 1956 from Ohio State, which offered a challenging dental hygiene program that only accepted 80 students out of over 300 applicants. Years later, Julie graduated from the Dental Hygiene program at Ohio State in 1991, and is pictured practicing at the office of Dr. Mary Peebles-Turner, DDS, PC in Broomfield, Colorado. As you can see, there have been many changes in the hygiene profession during the last 60 years. Foremost, the difference in equipment from 1959 to today is an incredible advancement in technology. Notice how Dr. Weisenstien’s office boasted the first black and white television! Nowadays, color monitors are standard in dental practices and used in a variety of ways to present treatment and films, as well as entertainment during patient appointments. Other current day standards involve infection control precautions regulated by OSHA, such as the use of gloves, masks and protective eyewear, as well using disinfecting solutions. Additionally, it is fascinating to take a look at the difference in cost for dental treatments. In 1959, the cost for x-rays was only $12 and the cost of a cleaning was $38. In 1959 dental insurance coverage did not exist. Today, x-ray costs range from $28-99 as dental technology has expanded vastly to include digital panoramic and CT scan style films. The cost for cleanings range from $100-$1200 depending upon the level of periodontal disease present as determined by such advanced technology in x-rays and diagnostic procedures. And of course, now we have a wide variety of dental insurance programs to help make these procedures affordable for everyone. It is no secret though, that the most important objective in the dental hygiene field is patient education for better oral health. 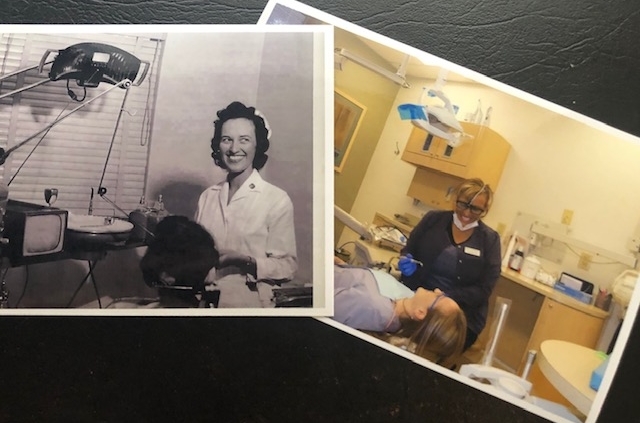 The photos below show both Julie and her mother Marilyn enjoying interaction with their patients while they are educating them on the best techniques to keep their smiles healthy.